Gary Rogers; Sean Gannon, Brian Gartland, Andy Boyle, Dane Massey; Richie Towell, Chris Shields; John Mountney (Darren Meenan 63), Ronan Finn (Kurtis Byrne 84), Daryl Horgan (Jake Kelly 80); David McMillan. Conor O'Malley; Conor McCormack, Sean Hoare, Kenny Browne, Ian Bermingham; James Chambers (Lee Desmond HT), Greg Bolger, Killian Brennan; Conan Byrne (Ciaran Kilduff 66), Christy Fagan, Chris Forrester (Aaron Greene 78). Dundalk recorded their third win in the Airtricitry League Premier Division with a 3-0 victory over a St Patrick's Athletic side who finished the game with nine men. The result puts the champions top of the table after three games and lifts them six points ahead of Liam Buckley's outfit, a considerable gap even at this stage of the campaign. Goals from Brian Gartland and a David McMillan brace did the damage but Buckley will feel his side hit the self destruct button with Conor McCormack and Killian Brennan both sent off. Dundalk named an unchanged side from the one that beat Pat's in the President's Cup three weeks ago. Stephen O'Donnell, who is close to a return from a cartilage injury, was the only one player that Stephen Kenny was unable to call on. Pat's arrived without the services of regular goalkeeper Brendan Clarke who missed out with an ankle injury. Conor O'Malley, a winter signing from Shamrock Rovers, was drafted in to make his Premier Division debut. It was the only change to the team that beat Bray Wanderers in their previous outing. New Hawaiian signing, Morgan Langley, took his place on the bench. A lively first-half meant that the opening 45 minutes completely zipped by.The Lilywhites started on the front foot and threatened after just four minutes. McMillan hooked the ball in behind the Pat's backline but Kenny Browne did well to stand his ground and halt Richie Towell's progress. 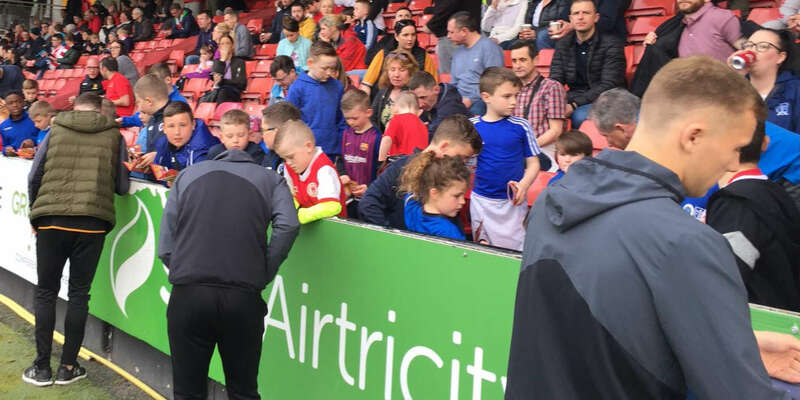 The visitors adopted a policy of pressing their hosts high up the pitch and they almost got their reward in the tenth minute when Christy Fagan hustled Gartland on the edge of his own penalty area. A harsh decision by referee Paul McLaughlin let the Dundalk centre-back off the hook. The home fans demanded a more direct approach and they got it seconds later when Andy Boyle's pass forward found McMillan on halfway. He sought out the penetrating run of Horgan but the ball had too much pace and O'Malley came to gather. The next 20 minutes saw the champions control the game and they took a deserved lead after 16 minutes. Towell looked to have squandered a golden opportunity when he took too many touches from another incisive Horgan pass, allowing Forrester to clear the ball for a corner. However the set-piece approved decisive with Gartland rising highest in the crowd to power his header home. The champions sensed a second goal and Chris Shields tried to get in on the act, steering an effort wide after breaking a Pat's attack on the halfway line and driving towards goal. Finn then saw a 20-yard drive deflected wide of the upright. Pat's needed some respite and they got it when Killian Brennan broke up a Dundalk attack and won a free from Gartland, the Lilywhites goalscorer going into the book as a result. That break in play stemmed the Dundalk tide and the Inchicore side improved as the half wore on with Chris Forrester bringing the best out of Gary Rogers with a fierce 29th minute drive. Conan Byrne's subsequent corner was brilliantly defended by Massey who managed to head the ball away from under his own bar despite heavy pressure from Browne. Pats were left with an uphill task when they were reduced to ten men on the stroke of half-time. Conor McCormack, booked in the 19th minute for a crude tackle on Horgan, could have had no complaints, picking up a second yellow card for stupidly jumping into Massey right in front of the dug-outs. Despite the numerical advantage, Dundalk struggled to get going in the early part of the second-half and they were fortunate to see a Fagan effort flash just wide on the hour mark. Pat's looked well in contention but their hopes of a comeback went up in smoke three minutes later when Killian Brennan was shown a straight red for clashing with Towell. Buckley's stoney gaze said it all as the Drogheda man made the walk to the tunnel. It was game over three minutes later. 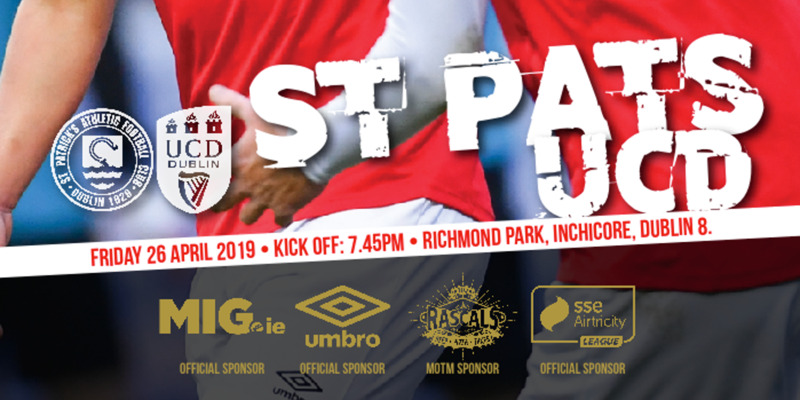 Substitute Darren Meenan's out swinging corner fell perfectly for David McMillan and the striker guided a wonderful first-time volley past O'Malley before he completed a great night for the champions late on, turning home a Dane Massey cross. 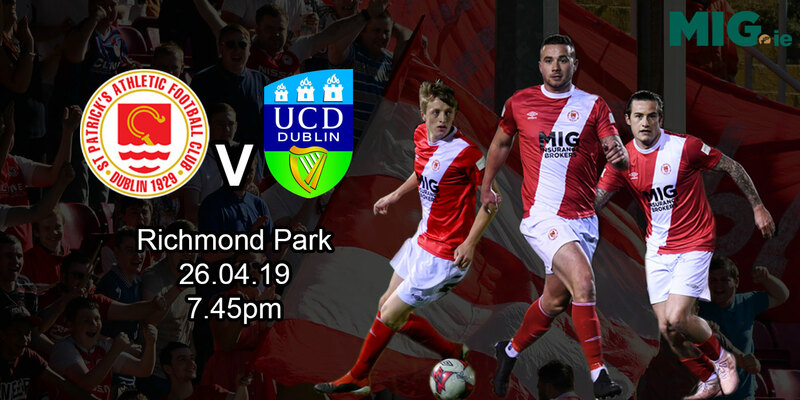 UCD Tickets On Sale Now!